Address: 2605 Adobe Canyon Rd. Sugarloaf Ridge State Park sits amidst a biologically rich crossroads for many of California's native flora and fauna. Here it's possible to catch glimpses of the state bird, the state tree, the state flower, and even the state rock. And yet, the park was an afterthought that almost never came to be. The State of California bought the property in 1920 with the intention of damming up the creek to create a reservoir to facilitate the production of electricity for Sonoma State Hospital. Local opposition to the plan helped shelve the idea. It eventually became part of the state park system in 1964. 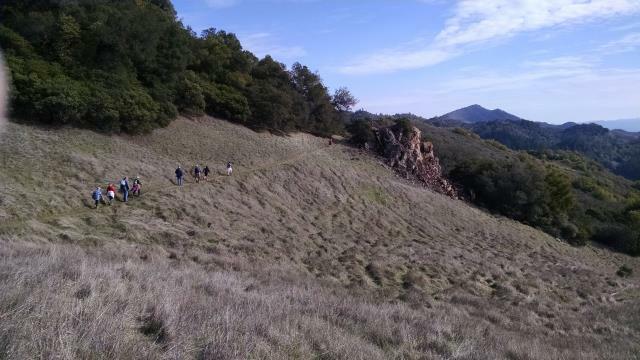 A guided hiking group heads towards a rocky overlook of Sonoma Creek valley. The park contains the headwaters of Sonoma Creek. Though some relatively flat meadows bracket the creek itself, much of the park is made up of peaks along the Mayacamas Mountains that continue south towards the town of Sonoma. The high point in the park is Bald Mountain, which rises to 2,729 feet above sea level. That sits about 1,500 feet above the elevation of the park headquarters building. The parks has somewhere between 20 and 25 miles (depending on the source of your information) of trails, ranging from paved paths to natural packed dirt and even some rocky scree-like segments. Napa Valley as seen from the summit of Bald Mountain. The trail to the summit of Bald Mountain is mostly paved, which doesn't make for the most natural of hikes, but it does provide an smooth and even surface that might help to offset the difficulty from the steepness in places. There are alternate routes to the peak that take a more circuitous route (such as via the Gray Pine Trail) if one wants to avoid pavement. About a third of the way up Bald Mountain lies Vista Trail. Not only does it provide a convenient turning point to complete and more leisurely loop back to the park HQ, it also features a prominent rock outcropping worth a visit all its own. I thought our guide called this feature Indian Rock. 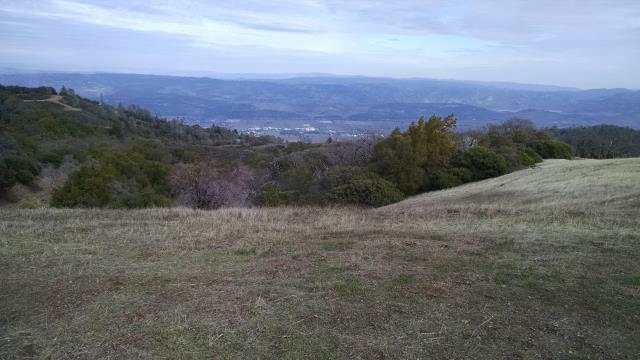 It juts up and out from the trail providing breathtaking and sweeping views of Sonoma Creek valley before it empties into the larger Sonoma Valley. From the top of Bald Mountain one can easily peer into both the Sonoma and Napa valleys, two of California's most celebrated wine cultivation areas. On clear days one is also supposed to be able to see the Golden Gate Bridge to the south, the Pacific Ocean to the west and the Sierra Nevada Mountains to the east. The peak can be windswept and quite chilly compared to the areas just beneath it so dress in layers. Gray Pine Trail provides a natural packed dirt and sometimes rocky path down the mountain to the east. The trail here is occasionally steep and requires some careful footing in places. Like many other state parks, Sugarloaf was threatened with closure due to severe budgetary cutbacks. Team Sugarloaf non-profit organization was organized to take over operation. Please consider making an extra donation to the organization when you visit. Coppertone and I decided to hits the trails for the first time in months in part to see the falls here while the water levels were high. It just would not be the same in the fall when there might best be a trickle. We walked past the park entrance gate along the road until we got to the Canyon Trail trailhead. 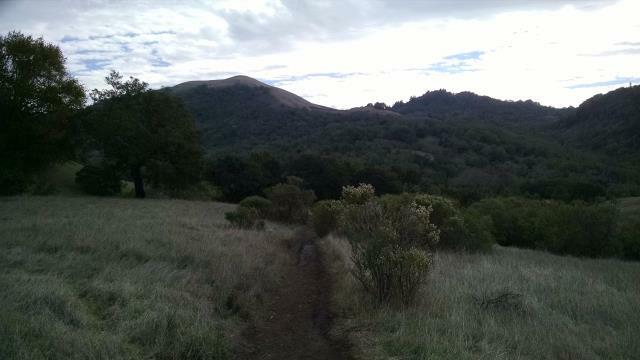 The trail immediately begins a consistent descent towards Sonoma Creek below. The path all along this trail and mostly through Pony Gate Trail is heavily treed, providing some relief from the Sun. Just prior to encountering the main falls on the trail there is a miniature but long, multi-step falls that of a seasonal stream that feeds into Sonoma Creek. It was worth a stop of its own. Compared to its larger companion nearby, the falls here provide but a whisper. The main falls, which seems to have no official name, is a short distance beyond and at high flow levels provides a nice aquatic roar that drowns out most other sounds nearby. It was not crowded at the falls, but during our time at the spot there was always someone coming or going. It's obviously the highlight of the trail. The trail continues on to the west this time ascending until it intersects with Adobe Canyon Road that leads into the park. We took a right for a short distance along the road to the Pony Gate Trail trailhead. From here, it's more uphill hiking. The dense vegetation doesn't provide for much of a view but there are several additional streams, all easily fordable, bubbling and darting around their rocky beds. Rather than continue on a small unhiked section of the Canyon Trail back to Adobe Canyon Road, we elected to go with the unnamed trail that heads more directly to the park entrance gate. This choice minimized the distance we would have to walk along the road to get back to our parking spot. It also turned out to be a fortuitous choice. The sky opened up as the trail gently descended down a grassy meadow with the peaks of Sugarloaf Ridge clearly visible in the distance. A fine way to end the hike. We found that we are both woefully out of shape! This wasn't a particularly hard hike and the elevation gain was not that high, but we suffered far more than we should have - a sure sign that we need to make a point of hitting the trails more often. Coppertone and I returned the the scene of our last failed hike here. In February we went on a Bill and Dave's hike here but had to turn back due to Coppertone's blisters. With a new set of trail shoes she decided now was the time to recreate the scene of the crime. Thankfully her new shoes worked out great and we were able to complete what we think was the original hike's route. The 1,500 feet of elevation gain and our reaction to it indicates that we are still not into true trail form. We took our time ascending up the mountain via Gray Pine Trail and rested frequently to observe the wildflowers that are in bloom and the regenerative processes at work as the park and the surrounding area recovers from the devastating 2017 wine country wildfires. There are parts of the park that look like the aftermath of a war zone. But even in those charcoal back colored areas the monotony of the color is starting to break as more and more green pops up from the inky black. Trees and brush that were burned to a crisp are resprouting from whatever place possible, even if that is only from the base of their ruined trunk. Bald Mountain and Lower Bald Mountain seem to have larger swaths of decimated terrain that is just starting to come back. Gray Pine also has pockets of destroyed foliage, but they tend to be a bit more spotty and miraculously untouched stands of trees punctuate the area more frequently. As we have learned, fire is a capricious beast. One of the upsides of recent fire activity is the expectation that this year's wildflower season should be above average. Right below Bald Mountain this is borne out by large fields of wildflowers that blanket the steep hillsides. Blue lupine are abundant as are a white flower I couldn't identify. A couple of guys set a bad example for all by trampling right over some of the flowers so they could get a selfie against the backdrop of flowers they didn't happen to ruin. There are plenty of angles for getting a shot of these flowers. Stay on the trails and do everyone else a favor by ensuring the flowers will be healthy for them as well. As is typical, the top of Bald Mountain was windy. This felt fairly good after the tiring clime to the top. There's a new beanch and set of signs that have been put in place since the fire. From this high point one can clearly see into both Sonoma Valley and Napa Valley. With the aid of the handy signs we were also able to pick out distant peaks such as Mount Tamalpais in Marin County and Mount Diablo on Contra Costa County. We took the easy way down via Bald Mountain Trail. A good portion of this trail is paved and presented the shortest route back to the car. Coppertone and I went on another Bill and Dave's led hike. We had to turn around after a couple of miles because Coppertone's blisters from a previous hike has opened up and the 3M tape she had applied was no longer working in her favor. We had to cut things short but proceeded to the nearest REI to buy some different shoes for her since the hiking boots she has really give her issues on steep terrain. There was plenty of that here. Coppertone and I did our first hike with Bill and Dave Hikes. The solitude rating here does not take into account the 29 people who were part of our hiking group. Other than us, we saw few people on the trail. We started off in the adjacent Hood Mountain Regional Park since its Los Alamos parking area is the only way to get to the McCormick Addition section of Sugarloaf Ridge. A quick descent to Santa Rosa Creek, which was easily forded, and it was lots of climbing after that in Sugarloaf Ridge SP itself. Our main goal of the hike was to get to the Granmother Tree, the largest Coastal Live Oak in Sonoma County. Resting for a few moments under the grand old dame, a couple of our fellow hikers recited a couple of poems, one specifically written for the tree. Official maps show the trail dead ending at the Grandmother Tree, but we contnued on to a lunch spot atop a peak surrounded by higher ridges. This gorgeous spot provided over 180 degrees of vistas of forest, shrub and grassland. We could have lingered for hours and been content. We took a shortcut down to the Maple Glen Trail and eventually doubled back to the trailhead. The hiking pace was brisk and the terrain tough, so much so that by the end of the hike we were exhausted. Obviously we need to work on our endurance!